The hexes are constructed using skills we learned in geometry, for bisecting lines and angles, dividing a circle into 6 equal arcs and by connecting points on these figures and circles with arcs or lines. Non-geometric motifs are positioned equally spaced around the circle using guide lines, which are then erased. The non-geometric forms can be hand painted, or traced on lightly with a pencil from a pattern cut from stiff paper. Traditional hexen are painted directly on the barn surface, and use a minimal number of colors, typically black and white against the red of the barn. The painter used a compass made from a nail, string and pencil to inscribe large circles and arcs. Modern hexen are painted on plywood circles and mounted with screws. They can also be painted on smaller circles for display in the house, and sometimes are used to adorn hope chests, baby cradles or boxes -- decorative or functional. 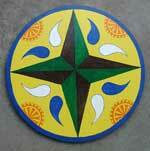 I also paint the designs on muslin circles mounted in primitive circular wooden frames, for indoor use. Most hexen available commercially are mass produced by screen printing on metal or masonite. The latter lacks durability and if mounted outside, will warp and curl quickly in the weather. 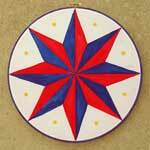 Check out the hex STORE for examples of traditional hex signs and modern designs in the manner of the folk tradition. Most are available both on exterior grade plywood, painted with Glidden exterior house paint, and for indoor display only, on stretched 100% organic cotton muslin. If you are interested in commissioning a custom hex for your house, garage or barn, email the artist and we can discuss your needs. Be sure to browse some of the previously commissioned custom hex signs that I have deisgned and painted.